Ilina Arsova, visual artist, passionate climber, mountaineer & telemark skier. 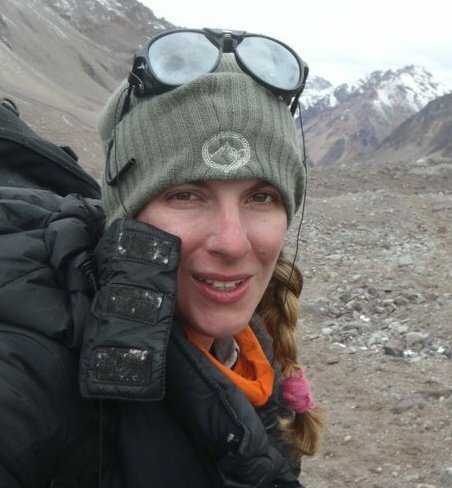 First Macedonian female climber who summited Mount Everest 8848m (May 2013), Denali 6195m (May 2016), Ama Dablam 6856m (Nov 2011), Aconcagua 6962m (Feb 2011), Matterhorn 4478m (Jul 2010), Vallesitos 5500m (Argentina, Feb-2011), Haba 5350m (China Apr 2009) and about a dozen more climbing routes, mountains, volcanoes and technical rocky peaks around the globe. As an artist performes internationally on solo and group exhibitions. Her latest projects were shown in: Sao Tome (Africa), China, Malaysia, New York, around Europe and Balkan countries. Highly respecting the nature and the environmental laws, since 2004 she is spreading the ecological message through art works. Her artistic research subjects are developing from polluted landscapes to overconsumption of the hyper modern world. Her visual expression includes mixed media, paintings, drawings, video, installation. Re-used material and objects are often found in her works which is an attempt of transforming one's personal waste into piece of creative work.